Home>News of Construction and Building > Are bladeless wind-turbines the next big thing? Are bladeless wind-turbines the next big thing? 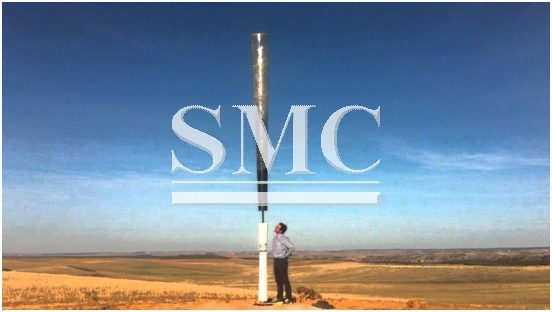 Spanish company ‘Vortex’ are potentially about to revolutionize the renewable energies industry and more specifically, wind-energy. Vortex is an adaptation from the original wind-turbines, basically it doesn’t need the blades to operate. Their idea is the Vortex, which just consists of the ‘stem’ from a turbine. The Vortex has the same goals as conventional wind turbines: To turn breezes into kinetic energy that can be used as electricity. But it goes about it in an entirely different way. Instead of capturing energy via the circular motion of a propeller, the Vortex takes advantage of what’s known as vorticity, an aerodynamic effect that produces a pattern of spinning vortices. Its makers boast the fact that there are no gears, bolts, or mechanically moving parts, which they say makes the Vortex cheaper to manufacture and maintain. The founders claim their Vortex Mini, which stands at around 41 feet tall, can capture up to 40 percent of the wind’s power during ideal conditions (this is when the wind is blowing at around 26 miles per hour). Based on field testing, the Mini ultimately captures 30 percent less than conventional wind turbines, but that shortcoming is compensated by the fact that you can put double the Vortex turbines into the same space as a propeller turbine. The Vortex team says there are some clear advantages to their model: It’s less expensive to manufacture, totally silent, and safer for birds since there are no blades to fly into. Vortex Bladeless says its turbine would cost around 51 percent less than a traditional turbine whose major costs come from the blades and support system. Plus, Suriol says, it’s pretty cool-looking. The date for the release is yet unspecified, however, it can surely be expected to come soon rather than later with the advantages offered.